I recently got a dehydrator and decided to try it out this week. My friend Peggy, who picked the dehydrator up for me, had bought some cranberries that she was going to try drying for me. Since I brought the dehydrator home before she had a chance to dry the cranberries, she sent those, too. So I decided to do the cranberries, and I threw some apples in there too, since the settings were the same. The directions said to wash the cranberries and dry them whole, slice the apples and soak them in lemon juice for 2 minutes before putting them in. Cranberries were supposed to take 18 hours, and apples 23. In a bowl, pour boiling water over the cranberries or submerge them in a pot of boiling water with the heat turned off. Let them sit in the water until the skin pops. Do not let the berries boil or the flesh will turn mushy. Drain. If desired, coat the berries with either a light corn syrup or granulated sugar. Transfer the berries to a cooking sheet and place them in a freezer for 2 hours. Freezing the berries helps in breaking down the cell structure promoting faster drying. Put the berries on a mesh sheet in the dehydrator and dry for 10 to 16 hours, depending on the make of the dehydrator, until chewy and with no pockets of moisture. Another method of drying is to turn on the oven for 10 minutes at 350 F. Then place the cranberries on a cookie sheet in the oven, turn off the oven, and let them sit overnight. Store dried cranberries in the freezer. Keep in mind that dried cranberries can be used in place of raisins in recipes! Source: Mary Bell 's "Complete Dehydrator Cookbook"
I don't want sugar on my dried cranberries, but the rest of it makes sense. So, I poked all the cranberries and opened them up. They felt like they were about ready to pop, but who knows how long that would have taken. Now I just have to keep an eye on them to see when they're dried, finally. Also, I should probably see if I can get a dehydrator cookbook from the library, to see what else I can do. In Dutch oven or large saucepan, bring 1/2 cup of broth to a boil over medium heat. Add onion and garlic and cook, stirring often, until onion softens, about 5 minutes. Add squash, tomatoes, corn, thyme, salt, pepper and remaining 2 cups broth; stir to blend. Bring to a boil. Reduce heat, cover and simmer 10 minutes. Add kidney beans and green pepper and return to a simmer. Cover and simmer until squash and bell pepper are tender, about an hour or so. (The original recipe said cook 10 minutes, until squash and bell pepper are tender but not mushy. However, I like my squash mushy, so I cook it longer.) Serve warm. I usually eat this one by myself, but that's OK because I love it. It's best if you cook it one day and reheat the next - and it gets better every time you reheat. I recently found a recipe for Butternut Chicken Stew over at Simple Daily Recipes, and everyone loved that one. Though they're not exactly the same, they are similar. Maybe next time I make this, they'll give it a try. Update: The recipe for Butternut Chicken Stew has been published in this cookbook - Simple Daily Recipes Reader's Favorite Dinners - along with a lot of other yummy recipes. This is one of our favorites, Jeffrey's and mine, anyway. The kids aren't all that impressed, but we love the combination of flavors. I adapted this recipe from a Pillsbury Bake-off recipe. Heat oil in large skillet over medium heat until hot. Add onion and garlic; cook and stir 2 to 3 minutes or until tender. Stir in peanut butter, cumin, cinnamon and ground red pepper; mix well. Add sweet potatoes and beans; mash slightly. Reduce heat to low; cover and simmer 2 to 3 minutes or until thoroughly heated, stirring occasionally. Meanwhile, heat tortillas according to package directions. 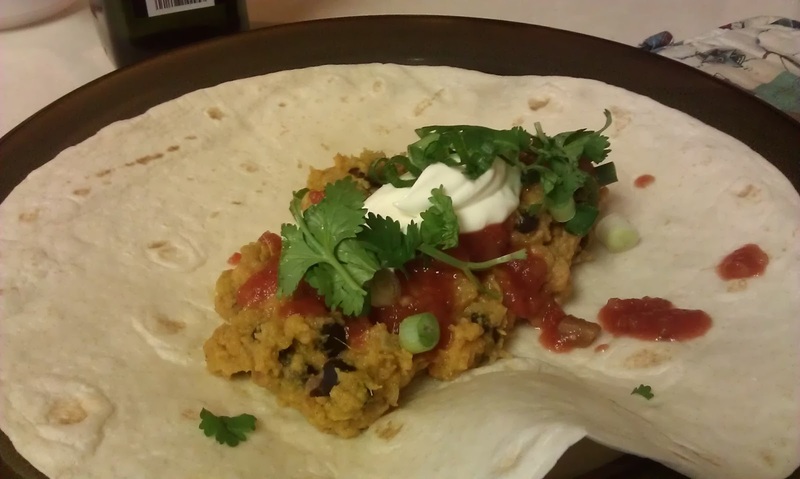 To serve, spoon and spread scant 1/2 cup sweet potato mixture across center third of each tortilla. Top each with 2 tablespoons salsa, 1 tablespoon sour cream, 2 teaspoons green onions and 1 teaspoon cilantro; spread to cover sweet potato mixture. Fold sides of each tortilla 1 inch over filling. Fold bottom 1/3 of tortilla over filling; roll again to enclose filling. In a large kettle, cover beans with water; bring to a boil. Boil for 2 minutes. Remove from the heat and let stand 1 hour. Drain and rinse beans; return to the kettle. Cover with water again and bring to a boil. 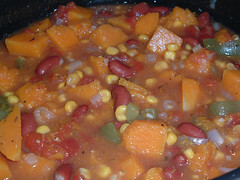 Reduce heat; cover and simmer for 1-1/2 hours or until beans are tender. Drain and rinse beans; place in a large bowl and cool to room temperature. Add the onion, peppers and corn; toss. In a saucepan, combine all dressing ingredients; simmer for 10 minutes. Pour over vegetables and mix well. Cover and chill. Cream margarine, oil and sugar. Add eggs, vanilla and sour milk. Beat well with mixer. Mix together dry ingredients and add to creamed mixture. Beat well with mixer. Stir in diced zucchini. Spoon batter into greased and floured 9"x13" pan and sprinkle top with chocolate chips. Bake at 325° for 40-45 minutes or until toothpick comes out clean and dry. One of the favorites at our house. It started one day when Jeffrey brought home a couple bags of (cheap) overripe bananas, and I had to find something to do with them. Blend bananas, sugar and egg together. Add flour, baking soda, baking powder and salt. Blend well. Stir in margarine and nuts. 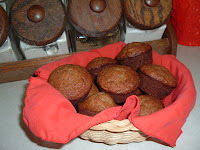 Fill paper-lined or greased muffin tins 2/3 full. Bake at 375° for 15-20 minutes. The original recipe called for the chocolate chips. While I like nuts in these, the rest of the family wants chocolate chips. Also, I usually use at least 1/2 cup whole wheat flour when I make them. Note: if you have overripe bananas but you're not ready to use them, you can peel them, wrap them in plastic wrap, and put them into a zipper bag in the freezer. Then, when you're ready to bake muffins or banana bread, simply take out the desired number of bananas, unwrap, let sit out to thaw, and you're ready to go. I made this for lunch quite a while back and almost forgot about it. I had some cooked turkey in the refrigerator that I needed to use, and this recipe popped into my head. Actually, the memory of this recipe popped into my head, but no matter how hard I looked, I could not find it. I almost gave up, but gave it one last try and finally found it. I'm so glad I did, because this is really good. Soak raisins in hot water (or, if you cooked the chicken, the chicken broth) for about five minutes. Drain well. Stir everything except the cheese together. Lightly grease a 2-qt casserole, and lightly place mixture into it. Sprinkle with cheese. Bake at 450 degrees for about 10 minutes. Serve warm with bread, croissants, or crackers. Since this was just for me (no one else in this house likes raisins), I halved the recipe. I mixed everything right in the dish I baked it in, popped it into the oven, and baked it. I did end up baking it for somewhere between 15 and 20 minutes because I like my cheese a little more cooked. Next time I think I'll add a little salt and pepper, too. It was wonderful with round snack crackers - think Ritz. I ate about half of it, so I have the other half for lunch today or tomorrow. YUM!